I'm almost embarrassed, as someone who reads a lot, to admit that I have never read anything by J.R.R. Tolkien. In my defense, I'm not a big fan of high fantasy so the stories have never appealed to me. 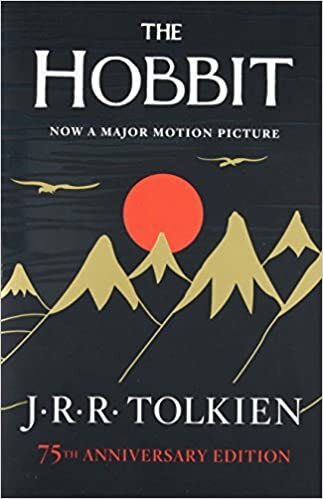 That being said my husband and I just finished a movie marathon where we watched all of The Hobbit and Lord of the Rings movies (in that order) so I decided to give the book chance. Which I'm happy I did. To make the story more enjoyable I decided to listen to the audiobook. I enjoyed the bright narration and the short musical interludes that proceeded each chapter. I think this form made the story feel more like a movie, rather than me drudging through another high fantasy novel I'm only marginally engaged with. Now, this is going to sound kind of ridiculous but I'm rating this novel 4-stars because I actually enjoyed the movie series more. This story is pretty short and the details weren't as fleshed out as I expected. Peter Jackson turned this single book into three movies so naturally, he included things that were merely alluded to in the original but were expanded on in the movie in greater detail. He also included things that weren't in the book at all. I can see how this would upset fans who love the story and wanted the movie to stay as true to it as possible. For me, I liked all of the side things Peter Jackson added; the relationship between the girl elf and the dwarf, Legolas, Bard's family, and my personal favorite part of the movie where Smaug is dipped in gold. Those moments were scene sealers for me so to not seem them mirrored in the print was a little disappointing. Overall, this was an enjoyable listen. I enjoyed the full cast of characters and the hero's journey that Bilbo embarks on. This is truly a timeless tale and if you're like me and haven't read it yet definitely give the audiobook a try. I think you'll be pleasantly surprised.